The Ruddock Creek project is located near Tum Tum lake in the headwaters of the Upper Adams River. The project is in the advanced stage of exploration but has not obtained the consent of Neskonlith for current or any future activities. The Secwepec territory includes the Adamas River Watershed – home to the world’s largest sockeye salmon run and the location of Imperial’s Ruddock Creek lead and zinc project. The area is of great importance to the Neskonlith who continue to use and occupy the area for hunting, gathering, education and ceremonies. In addition to being the headwaters of the Adams River, the area is also home to threatened mountain caribou and grizzly bear populations. “As part of the Secwepemc Nation, the Neskonlith retain Aboriginal title and rights to their territory and have never surrendered the land to British Columbia,” further states Billy. Imperial Metals is also planning two mining projects in Clayoquot Sound. 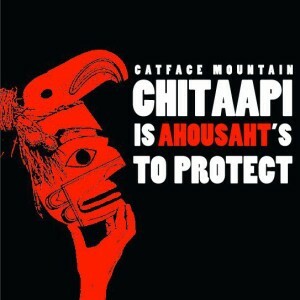 Chitaapi (Catface Mountain) in Ahousaht territory, contains low-grade copper-molybdenum ore. Catface Mountain mine is a mountain-top removal scheme that would take place only 3 km from the village of Ahousat. Fandora, a potential gold mine, would be at the head of Tranquil Valley, on Tla-o-qui-aht territory, for which the provincial government is currently reviewing an application for exploration. They have not consulted with the Tla-o-qui-aht, who are opposed to mining in their homelands.